When John Smyth organized the first Baptist church, he wanted to establish the New Testament church; believer’s baptism was the missing link. 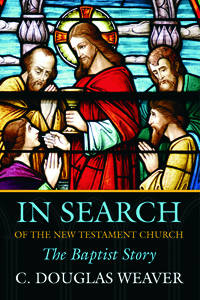 Baptists of subsequent eras often continued the search to embody “New Testament Christianity.” Unique to surveys of Baptist life, Doug Weaver highlights this restorationist theme as a way to understand Baptist identity. Weaver does not force the theme, but the “search” is ever present. It is found in the insistence upon believer’s baptism, but also in examples like the Sabbath worship of Seventh Day Baptists, the “nine rites” of colonial Separate Baptists, the women preachers of Free Will Baptists, the “trail of blood” of Landmarkism, the social gospel of Walter Rauschenbusch, the “fundamentals” of fundamentalism and the ministry of the European pioneer Johann Oncken. Like other recent Baptist studies, Weaver describes Baptist diversity. Still, he highlights the persistent commitment of most Baptists to an informal constellation of “Baptist distinctives.” Alongside the quest for the New Testament church (and congregational community), Weaver especially highlights the Baptist commitment to religious liberty and the individual conscience. This emphasis, while later reinforced by Enlightenment ideals, could already be found in the biblicist piety of the earliest Baptists who insisted that individual believers must have the right to choose their religious beliefs because they would stand alone before God at the final judgment. Both chronological and thematic, this book addresses such themes as the role of women, the social gospel, ecumenism, charismatic influences, and theological emphases in Baptist life. The book’s focus is America, but it also includes helpful introductory chapters on early English Baptists and international Baptists.